The sudden death of one of the reactionary judges on the United States Supreme Court, Antonin Scalia, on February 13, 2016, can have a major impact on teacher unions -- and other public worker unions. Scalia was expected to rule in favor of the claim by "teachers" that Agency Fees were a violation of their rights under the First Amendment. Antonin Scalia. Nation photo.The sudden death of Justice Scalia was everywhere in the news late on February 13. Most observers agreed that the Senate (currently dominated by Republicans) won't appoint any Justice nominated by President Obama. That will leave the Supreme Court with eight justices, and subject to tie votes. Senators are expected to wait and see the outcome of the November 2016 general elections. Scalia's death is expected to have a major impact on the "Friedrichs vs. CTA" case. The plaintiffs in the case argued that teachers should not be required to pay union dues, even as they enjoy the benefits negotiated by the union. 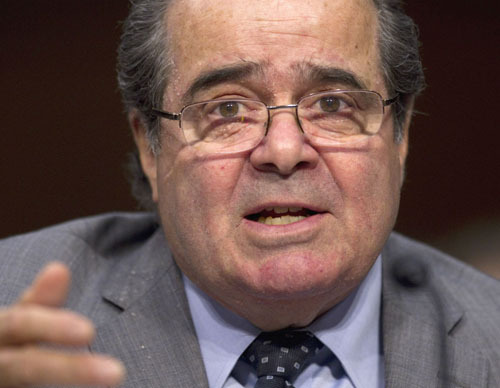 Observers predicted that Justice Scalia would be the swing vote. In the past, he had written an opinion against "free riders," workers who collect benefits without paying for them, but the pressure to expand the reign of the right was enormous. Because of Scalia's death, the Friedrichs case could end in a 4-4 Supreme Court deadlock. That would leave current laws in place. The impact on the Chicago Teachers Union would be enormous. The authors of the US Constitution did not outline a two-party system. Nor did they imagine that a plan for reasonable checks and balances would become a tool to empower petty obstructionists. The Constitution does not say that presidents may nominate justices. It says they shall do so. The Constitution does not say that presidents are limited in this duty by the timing when a vacancy occurs. There is no footnote that says presidents shall only perform their duties in their first terms. Nor is there a footnote that says members of the Senate shall only provide appropriate advice and consent when a president is in his or her first term. And there is certainly no language that suggests that a president�s nominee to the Court must parallel the ideology of the justice he or she would replace. That would leave a vital position vacant for a year. All the Republicans joined in this egregious assault on the basic premises of the Constitution and on the system of functional governance that is supposed to extend from it. The president is not naive. He knows that his nominee must secure the approval of at least a handful of Republican senators in order to be approved. But President Obama has already nominated two justices who have been confirmed with bipartisan majorities. He has a history of striking the right balance. The president was absolutely right to embrace the responsibilities of his office. And Senators Marco Rubio, R-Florida, and Ted Cruz, R-Texas, were absolutely wrong to suggest that it would be unprecedented for a term-limited president to appoint a justice. �It�s been over 80 years since a lame-duck president has appointed a Supreme Court Justice,� claimed Rubio, who joined the chorus of Republicans debaters arguing that President Obama should hand off the responsibility to a successor who they all seemed to presume would be a conservative. The debate moderator, John Dickerson of CBS News, pointed out that Supreme Court Justice Anthony Kennedy was confirmed in 1988. �He was appointed in �87, confirmed in �88,� said Dickerson. Cruz and Rubio, both of whom claim to revere the Constitution, both got a lot wrong. Justice Kennedy was nominated by a Republican president, Ronald Reagan, in November 1987. But he was not confirmed until February 1988 by the Senate, which was then controlled by the Democrats. Reagan, who could not seek a new term, met the definition of a lame duck. And 1988 was definitely an election year: Kennedy was confirmed five days before the Iowa caucuses and sworn in six days before New Hampshire�s primary. Kennedy was merely the most recent of more than a dozen justices who were confirmed during the course of election years. A number of other justices were nominated and confirmed on the cusp of election years. Justice Clarence Thomas, for instance, was confirmed in the fall of 1991�well after candidates had begun positioning for the 1992 race that would see President George H.W. Bush (the man who nominated Thomas) swept from office. It�s worth noting that, despite the proximity to an election, and despite the fact that the Senate was controlled by the opposition party, Bush nominated a new justice who was dramatically more conservative than the man he would succeed, Justice Thurgood Marshall. John Nichols is The Nation�s national affairs correspondent.